Whether you live in Texas, like I do now, on the east or west coast, you can enjoy the treasures of the sea with Stipple! Seashells. I've designed Stipple! Seashells with several goals in mind. If you're like me-you don't always have time to stitch a quilt-and designing one can be a daunting task. That's why you'll love Stipple! Seashells. It's fast, easy and produces flawless results. Quilt block sandwiches are easily embroidered, appliquéd and quilted in just a few easy steps. Just fuse your quilt sandwich, hoop and stitch. 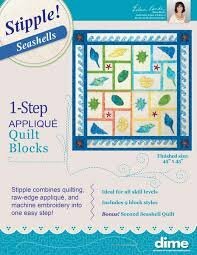 Complete your quilt with our Reversible Piecing Technique (included on every Stipple! CD) and you'll be done in no time! Plus it's easy to design your own quilt or follow the step-by-step instructions for making the two quilts featured on the packaging. Let the quilt reflect your personality! Select batiks, solid or printed fabrics-have fun with fabric color selection or let your creativity shine by adding crystal embellishments. The possibilities are endless! And you'll enjoy a new technique - continuous applique! The wave border looks really complicated but it's not! It's just one strip of applique fabric - you'll be surfing that wave in no time! Stipple is Fast! Stipple is Easy! Stipple is Flawless! Hoop quilt block, batting and backing in any embroidery hoop. Stitch color one - the appliqué outline. Stitch color two - Stipple! Step-by-step instructions for making two quilt projects! Eileen's Reversible Quilting Technique - Projects look beautiful from the front and back! Use your own hoop to stitch continuous embroidery with Stipple! Seashells. Visit Eileen's Machine Embroidery Blog to find out how!